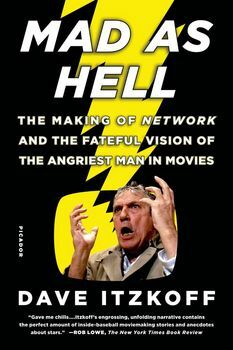 In Mad As Hell, Dave Itzkoff of The New York Times recounts the surprising and dramatic story of how Network made it to the screen. The movie was the creation of Paddy Chayefsky, the tough, driven, Oscar-winning screenwriter whose vision—outlandish for its time—is all too real today. Itzkoff uses new interviews with the cast and crew, as well as Chayefsky’s notes, letters, and drafts to re-create the action in front of and behind the camera. He also speaks with today’s leading broadcasters and filmmakers to assess Network’s lasting impact on television and popular culture. They testify to the enduring genius of Paddy Chayefsky, who foresaw the future and whose life offers an unforgettable lesson about the true cost of self-expression. “I’m mad as hell, and I’m not going to take this anymore!” Those words, spoken by an unhinged anchor man named Howard Beale, took America by storm in 1976, when Network became a sensation. With a superb cast (including Faye Dunaway, William Holden, Peter Finch, and Robert Duvall) directed by Sidney Lumet, the film won four Academy Awards and indelibly shaped how we think about corporate and media power.